This intriguing diagram shows which parts of your brain can contribute to your intelligence and how much of their smooth functioning you inherited genetically. Yes, sexual selection may be making you stupid - or smart. Genes appear to influence intelligence by determining how well nerve axons are encased in myelin - the fatty sheath of "insulation" that coats our axons and allows for fast signaling bursts in our brains. The thicker the myelin, the faster the nerve impulses. [UCLA neurologist Paul Thompson] and his colleagues scanned the brains of 23 sets of identical twins and 23 sets of fraternal twins. Since identical twins share the same genes while fraternal twins share about half their genes, the researchers were able to compare each group to show that myelin integrity was determined genetically in many parts of the brain that are key for intelligence. 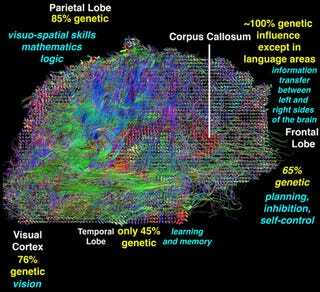 These include the parietal lobes, which are responsible for spatial reasoning, visual processing and logic, and the corpus callosum, which pulls together information from both sides of the body. The researchers used a faster version of a type of scanner called a HARDI (high-angular resolution diffusion imaging) - think of an MRI machine on steroids - that takes scans of the brain at a much higher resolution than a standard MRI . . . HARDI tracks how water diffuses through the brain's white matter - a way to measure the quality of its myelin. "HARDI measures water diffusion," said Thompson, who is also a member of the UCLA Laboratory of Neuro-Imaging. "If the water diffuses rapidly in a specific direction, it tells us that the brain has very fast connections. If it diffuses more broadly, that's an indication of slower signaling, and lower intelligence. So it gives us a picture of one's mental speed," he said.